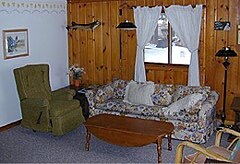 Northaire Resort offers Housekeeping Cottage Rentals directly on Clam Lake near Bellaire, Michigan. All housekeeping cottages face Clam Lake, are heated, have kitchens with pots and pans, utensils, dishes, coffee maker, toaster, all Iinens (except no towels in summer), television with basic cable, screened-in porch, row boat (no motor – motor rental at nearby marina, charcoal grill, picnic table. A classic Northern Michigan vacation retreat.